The short answer to the above question is you may not have to do much at all. Stick with your process; see if re-balancing is necessary. If you are worried, take inspiration from the following quotes. If you believe the market’s long-term trajectory is up, then market downturns provide opportunity. Perhaps you are feeling better now that the markets have delivered strong month-to-date gains in January. Unfortunately, it is too soon to know if the market is on its way to a new high, or if we are just seeing a rally during a longer-term downturn. In many ways, the market’s relatively low levels of volatility, particularly in 2017, spoiled investors. Over the past few months, some investors have found it much tougher to stick to their long-term plan. 4) The constant chaos in Washington. The truth is these all have likely played a role. However, there are probably other drivers as well. The only thing we can say for sure when the market falls is that there are more investors who want to sell stocks than want to buy them. This forces market prices to adjust downward to reach a new equilibrium and better balance supply and demand. Regardless of the cause, market volatility increased in the fourth quarter, reversing the overall stock market gains notched earlier in the year. The S&P 500 delivered a loss of about 6.2% for 2018. After falling into bear market territory – defined as a drop of more than 20% from recent highs – the tech-heavy NASDAQ was down 3.9% for the year overall. For the first time since 2008, all three of the major U.S. stock indexes (Dow, S&P 500, and NASDAQ) recorded annual losses. Investors may feel shell-shocked after the worst December for stocks since 1931, but it is important to maintain some perspective. The recent correction (or possibly the start of a bear market) was preceded by the longest bull market in history, so it could be viewed as an overdue repricing of stocks, as well as a reality check brought on by waning growth expectations. Unfortunately, emotions can get in the way of our financial goals. The primary emotions that impact financial behavior are fear – we sell when the market falls because we are afraid – and greed – we buy when the market rises because we want our share. It is also important to note that 2018 was more “normal” than the extremely low volatility levels of market volatility investors experienced in 2017. Investment markets, as well as the underlying economies, are expected to experience natural cycles over time. Trees don’t grow straight to the sky; asset prices are unlikely to go to zero either. Although our minds may recognize trends and expect them to continue indefinitely, the market’s ups and downs are the norm, not the exception. Risk aversion is highly relevant to investing. It helps explain why “riskier” stocks have historically delivered better returns than more “conservative” bonds. Unfortunately, risk aversion makes us uncomfortable when the market trends lower. This is true even though rational investors recognize that markets that benefited from abnormal appreciation are more likely to experience a cyclical correction than continue ever higher. Most investors buy high and sell low – exactly the opposite of what is required if you want to be a successful investor. The market’s strong increase so far in January has been a welcome change compared to the market’s sharp declines in December. In fact, last month’s returns represented the worst December for stocks since the Great Depression. It also marked the first down year for S&P 500 since the end of the global financial crisis more than 10 years ago. Does this mean the bear market/market correction is over? The simple answer is I do not know. Does anybody know? Absolutely not. No one can predict the future. We can take some comfort in knowing the S&P 500 has only posted back-to-back losses four times since 1929. Regardless, past performance does not guarantee future results. Remember the goal is not necessarily to beat the market – at least it shouldn’t be. Your objective should be to fund your lifestyle, retire at a comfortable age, and achieve your personal and financial goals. At Apprise, we believe strongly in this view. One of the outcomes of creating a financial plan is it helps to inform the way your portfolio should be invested. There is no reason to take unnecessary risk in order to potentially generate higher returns when taking less risk can still allow you to achieve your goals. If you try to generate higher returns, you also increase the risk of realizing greater losses and falling short of your objectives. Investor portfolios are designed to help investors reach their financial goals. They are not a bank account for short-term cash needs. Volatility in investment portfolios should be expected. In fact, it is necessary to allow for long-term investment appreciation. If you are adding money to the market and are truly invested for the long-term, as long as the market maintains its historical upward bias, then market declines represent a long-term opportunity. Keeping this in mind should help you navigate the market’s ups and downs. If you flee the market during a downturn, you won't be positioned to take advantage of growth during an upswing. And if you are investing for a long-term goal such as retirement, a down market may be an opportunity to buy more shares at lower prices. Though it can be difficult to take the headlines in stride and control your emotions, sticking to a sound investment strategy is often the best approach. If you are a long-term investor (and money you have in the stock market should only be there for the long term), market upheaval like we have experienced over the last few months should not cause you to panic. Instead, view it as the price you pay for enjoying returns that, over long periods, are likely to be much higher than those for cash or bonds. If the market’s recent drop (and increased volatility) make you want to change your investment strategy, then you probably should not have invested in stocks to start. Big sell-offs can even occur during years that the market moves higher. 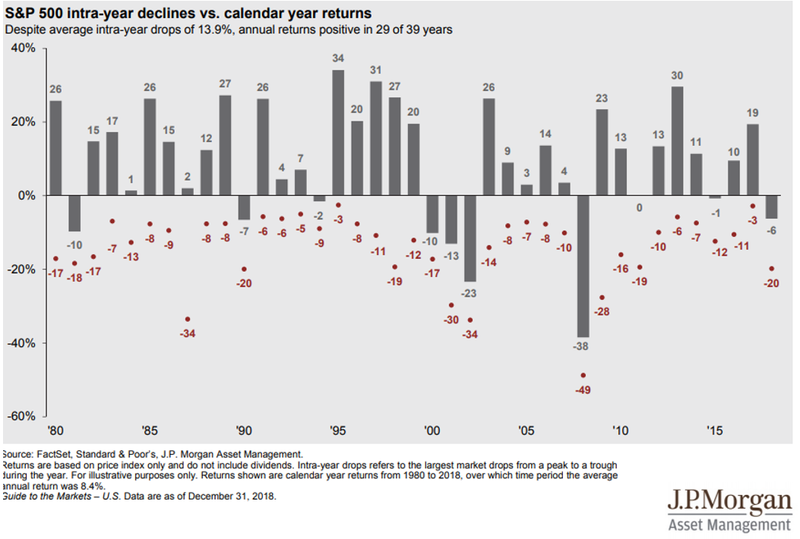 The following chart from JP Morgan Asset Management shows that “despite average intra-year drops of 13.9%, annual returns [have been] positive in 29 of 39 years. Staying out of the market in order to “wait out volatility” is a classic investor mistake make. When the market declines, it is best to take a deep breath and realize that as far as building wealth is concerned, it is “time in the market” rather than “timing the market” that matters. It should not be surprising to see volatility rise when the market declines. Falling markets are often driven by greater uncertainty. Investors lose confidence, making them more likely to reduce their allocations to the market. This tendency is partly driven by the financial media, as messages from market bears grow loudest when the stocks prices tumble. In part, it is hard to tell what volatility means because it is driven by so many uncertain data points. It can be hard to distinguish between true information and noise. Even if you only occasionally glance at the financial headlines, it should be clear that there is a lot of market noise. One reason for this is the media gets paid to chatter, and that chatter is used to attract viewers. Over time, we have become much more plugged in and our access to the news on a real-time basis has increased. This often leaves us with more data and more opinion and analysis about what that information might mean than we can effectively process. If you are a parent, it is likely that you have told your children that "patience is a virtue." You have probably reminded yourself of the value of being patient when you are with your children. If you are an investor, it is also important to be patient. It can help you take advantage of opportunities that impatient investors may throw your way. It can also help minimize the costs associated with your portfolio, as holding on to stocks for longer periods helps minimize your tax burden and limit the frictional costs associated with investing. For those who are unfamiliar with the term, frictional costs refer to expenses such as commissions and fees as well as the difference between the “bid” and “ask” price for a security. In the third edition of Robert Hagstrom's book “The Warren Buffett Way,” Mr. Hagstrom added a chapter on the importance of patience in investing. In a 2015 interview on John Mihaljevic's Value Investing Podcast, Mr. Hagstrom shared the results of some research related to the returns associated with various stock holding periods. The focus of the research was to determine, on average, how many stocks in the S&P 500 Index might double during a given time period. In reviewing stock returns over the last 42-43 years, Mr. Hagstrom found the following: On average only 1.9% of the stocks in the S&P 500 (or eight-to-nine stocks) doubled over a 12-month period. Using rolling three-year periods, the study concluded that only 15%-16% (about 80 stocks) doubled in value. If the rolling time frame was extended to five years, then approximately 30% (or 150 equities) doubled. Five years might sound like a long time to wait for a stock to double. It is not. That performance equates to a 14.9% annualized return. Nearly every investor should be more than satisfied if she can earn 15% annually from her investments. In fact, based on our review of annual performance, the S&P 500 generated returns of more than 15% in only 17 of the last 48 years (35%). Interestingly, the likelihood of the S&P rising 15% in a given year is only a little greater than the possibility of buying and holding an individual stock that doubles over a five-year period. If you are a savvy investor, what should you do during a time like this? If you have cash to invest, invest it. Many of the greatest companies around the world are on sale at a discount to their previous levels. The truth is, it is always hard to know when the market bottoms. The same applies to a market top – or even a middle. Never mind. That is not a strong enough statement. It is impossible to call any of those. The market’s short-term direction is unpredictable. The future is always unclear. Stock prices are truly only useful two times – when you buy, and when you sell. If the expected holding period is less than years, you are not investing, you are speculating. Remember that since 1926, there have been 16 times (including this one) when markets have declined by at least 10%. Past drawdowns lasted anywhere from two months to nearly three years. Each of the first 15 times the market recovered and went on to new highs. At this point, there is no reason not to expect the same this time. As shown in this post from the blog “A Wealth of Common Sense, ”historically, terrible quarters such as the one we experienced in December have led to strong returns over the next three and five years, in particular. The only exceptions were for the quarters ended in December 1929 and June 1930. Of course, there are no guarantees that history will be repeated, but the outlook for forward returns has likely improved from where they were before the fourth quarter began. If you don’t have cash to invest, then re-balance your portfolio to the model outlined in your Investment Policy Statement (IPS). If you are not sure how to do this, you can work with an advisor such as Apprise Wealth Management that does this for you as part of its regular service offering. If you don’t have cash, and you don’t have an IPS it is likely you are still trying to do everything yourself. There is no better time than the present to have a conversation with an advisor to help you manage market volatility with a plan in place. If you would like to talk to us, please fill out our contact form, and we will be in touch. We can schedule a call, a virtual meeting via Zoom, or a meeting at Apprise Wealth Management's office in Northern Baltimore County.